Brussels, Belgium – The ‘2015 Energy Productivity and Economic Prosperity Index’ launched today reveals the huge potential for societies to raise economic performance and extend significant environmental and social benefits through improved energy productivity. The Index, authored by The Lisbon Council, Ecofys and Quintel Intelligence and commissioned by Royal Philips (AEX: PHI, NYSE: PHG), is the first global report to rank countries by their energy productivity – based on their economic output per unit of energy consumed. The report warns that the current rate of energy productivity improvement – around 1.3% worldwide each year – is too slow to keep pace with the rising energy demand. The report finds that most energy productivity gains will need to come from improvements to residential and non-residential buildings. A simple illustration of energy productivity is boiling an egg, where only 2% of the energy consumed goes into producing the boiled egg. Similarly, nearly 98% of all energy we use in the process of production is being wasted. Just by increasing the use of technology today, such as energy-efficient appliances, LED lighting and insulation, European households could reduce their energy bills by a third. Furthermore, overall energy consumption in the EU could be cut by 35% by more than doubling the rate of the region’s energy productivity improvement from close to 1.5% to 3% per year by 2030. “Within the range of energy efficiency opportunities, LED lighting is a key contributor in addressing the soaring energy demand of the future as it already can deliver a 500% energy productivity improvement in average households. And by connecting LED lighting to sensors, apps and controls, even greater efficiencies may be realized. It is dramatically changing the way people experience and interact with light at home, at work and in their cities”, said Harry Verhaar, Head of Global Public and Government Affairs at Philips Lighting. According to the High-Energy Productivity Growth Scenario presented in the report, nearly 12 European households could be lit with a 1000 KWh of electricity, which is roughly what it takes to light two households today. 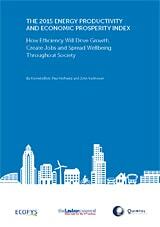 The report urges policymakers to set more ambitious targets to improve energy productivity. It demonstrates that high levels of energy efficiency will contribute to global economic growth: doubling energy productivity could create more than 6 million jobs globally by 2020 and reduce the global fossil fuel bill by more than EUR 2 trillion by 2030. To achieve this, further progress in the world’s six largest economies – the US, Russia, China, Japan, India and the EU – is most important as they account for 60% of global GDP and 65% of global energy demand. The Index ranks countries by the amount of GDP they produce for every unit of energy they consume. This differs from energy efficiency which means using less energy to deliver the same service. Hong Kong topped the list with an energy productivity of EUR 456 billion of GDP per exajoule (one quintillion - 1018 - joules) consumed. Cuba came second, boasting EUR 365 billion GDP per exajoule. Columbia, Singapore and Switzerland made up the top five. The United Kingdom is ranked 26th, behind countries such as Sri Lanka, Dominican Republic, Gabon, Philippines, and Albania. Other leading nations trailed further behind with Germany placed 35th, the Netherlands 40th, Japan 51st, France 56th and India 72nd. The United States, which has pledged to double its energy productivity by 2030, comes 87th. China placed 111th and Russia 114th– both countries with energy productivity well below the world average of EUR 143 billion. The 2015 Energy Productivity and Economic Prosperity Index is published at The 2015 Energy Union Summit convened by the Lisbon Council on 17 February in Brussels, a week before the launch of the EU’s Energy Union. The project – highlighted as a priority by European Commission President Jean-Claude Juncker – aims to ensure security of supply for Europe, create deeper integration of EU national energy markets, reduce energy demand, and cut carbon emissions. Established in 1984 with the mission of achieving “sustainable energy for everyone,” Ecofys has become the leading expert in renewable energy, energy and carbon efficiency, energy systems and markets as well as energy and climate policies. With a staff of 250, the company is based in Utrecht, the Netherlands with offices in Beijing, Berlin, Brussels, Cologne, London and Portland (the United States). Its website is www.ecofys.com. . The Lisbon Council for Economic Competitiveness and Social Renewal is a Brussels-based think tank and policy network. Established in Belgium in 2003 as a non-profit, non-partisan association, the group is dedicated to making a positive contribution through cutting-edge research and by engaging politicians and the public at large in a constructive exchange about Europe’s economic and social future. Its website is www.lisboncouncil.net. .
Quintel Intelligence is an Amsterdam-based energy modelling and research firm that assists governments, companies and institutions around the world in determining and quantifying their long-term energy strategies. Quintel believes that a better understanding of energy systems and connected food and water systems will help society deal with current and future challenges. Its website is www.quintel.com. .